The Meal Upgrade Calculator shows kids how they can “upgrade” some of your favorite dishes at breakfast, lunch and dinner so you and your family can reap the benefits of consuming less calories and fat. The key to “upgrading” a meal is to make small changes that will lower fat and calories while not making any tradeoffs in taste or convenience. 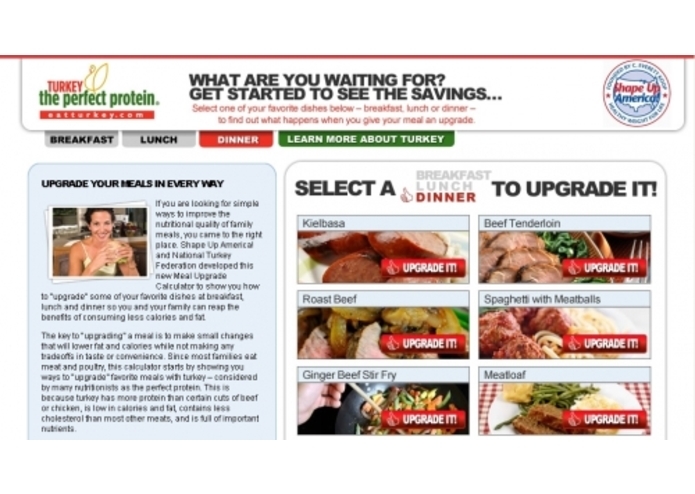 Since most families eat meat and poultry, this calculator starts by showing you ways to “upgrade” favorite meals with turkey – considered by many nutritionists as the perfect protein. This is because turkey has more protein than certain cuts of beef or chicken, is low in calories and fat, contains less cholesterol than most other meats, and is full of important nutrients. Users also have the opportunity to "upgrade" side dishes or condiments that will also lead to meaningful health improvements. In short, this calculator gives kids the power both to “upgrade” meals and their health.